Such A Lovely Couple, If Only The Supervillains Would Leave Them Alone Marc Webb's latest superhero sequel, The Amazing Spider-Man 2, brings an utterly charming Andrew Garfield and Emma Stone to a film wildly overstuffed with villains, plots, and even more backstory. Andrew Garfield's Spider-Man finds himself in a lovely romance, but is also stuck in far too many supervillain plots for one movie. 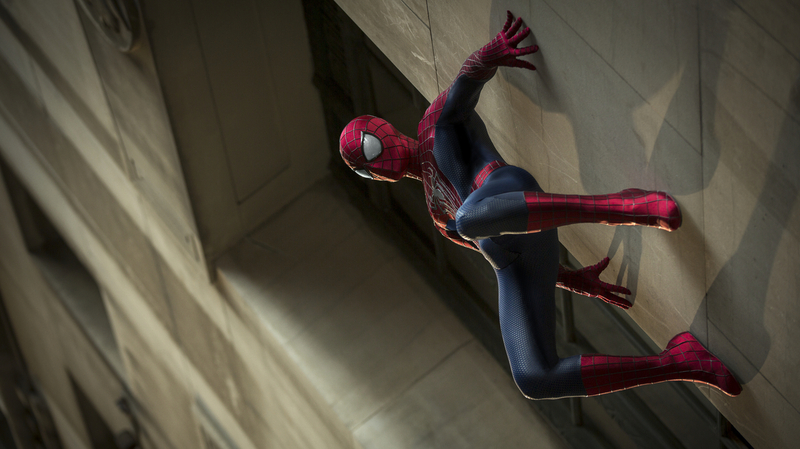 There's a great movie to be found in The Amazing Spider-Man 2, but it's not about superheroes, supervillains or impending urban calamities. It's a deeply felt and hugely winning romantic tragi-comedy about a pair of recent high school grads who are perfect for each other in every way, but just can't ever seem to get their timing right. As Peter Parker and Gwen Stacy, Andrew Garfield and Emma Stone don't just have chemistry on screen. They've got a rare Hepburn-and-Tracy-esque naturalism that flits from awkwardness to ease to unquestioned devotion in the space of a few shared glances. They don't just have spark, they have a buzzing, crackling electricity with power enough to light the New York City skyline. That Garfield and Stone are the best parts of the movie should come as no surprise: They were the anchor that saved director Marc Webb's 2012 Spidey franchise reset from complete irrelevance as well. But while they're perhaps even more of a pleasure to watch on screen this time around, the rest of the film gets bogged down in too many villains, too many origin stories and too many minutes of running time. It's those origins that are particularly maddening, since one of the pleasures of getting past the first installment of any superhero franchise is being able to dispense with the now-familiar expository notes of the hero's creation. But The Amazing Spider-Man 2 spends inordinate amounts of time setting up its villains (and even backtracks into the past to reveal even more details of Spider-Man's origin), only to dispatch them speedily in an overstuffed third act, as if Webb suddenly realized he'd set up too much story to resolve even in 2 1/2 hours. But Electro is a one-dimensional big bad, and is really only here to help facilitate Harry's transition to the Green Goblin. And the Goblin's brief appearance is really only there to set up the climax of the Peter and Gwen story — and to set up the next film. Rhino is even more of a throwaway, a device to help Spidey get his groove back after Webb tries to replicate much of the plot of Sam Raimi's 2004 Spider-Man 2 in the space of a short montage. There's something admirable in what seems to be Webb's intent here, to make a costumed crusader flick that's more about the people than the spectacle. The small moments, the physical comedy, Spidey's constant wisecracking — these things are all charming, but they're counterbalanced by stock summer blockbuster elements that Webb never seems interested in. What we get is a glimpse of how good Andrew Garfield and Emma Stone might be in a snappy, witty, old-fashioned romantic comedy — if only all those pesky scientifically engineered mutants would stop intruding.